Although the forest preserves are filled with dozens of different types of plants, people commonly associate them with the ones that grow trunks and shed their leaves in colorful showers each fall. Over 140 different kinds of trees and shrubs grow in the preserves. Trees and shrubs are quite different from other kinds of plants in that their stems — their branches and trunks — are covered in bark and increase in diameter each year as the plants grow. It's fairly easy to distinguish between a tree and a grass, but the difference between a tree and a shrub is not as clear. In fact, there is no scientific differentiation. Some arborists and ecologists generally call a woody plant a tree if it has a defined crown, is at least 13 feet tall when mature, and has a single trunk that’s at least 3 inches in diameter at 4.5 feet above the ground. Most readily call maples, oaks and elms trees but may call species like dogwoods or serviceberries either trees or shrubs. A tree or shrub’s familiar external layer, the “outer bark,” consists of dead corky cells. The outer bark protects the plant from heat, cold, dry spells, and insects. The “inner bark,” or “phloem,” contains tiny vessels that move nutrients from the leaves to the rest of the plant. Over time, as the phloem dies, it turns into outer bark. Xylem is the “wood” of a woody plant. It contains fibers that give a tree or shrub its strength and tubes that carry water and minerals from the roots to the rest of the plant. 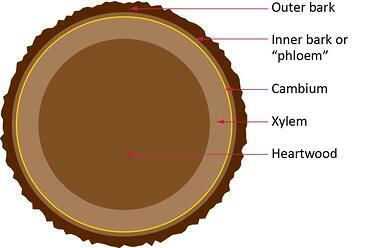 As xylem dies, it becomes the most inner “heartwood,” whose main function is to hold up the plant.